Early December 2018. It all started as a seemingly spontaneous explosion of student anger against the fees imposed on students for ‘re-sit exams’ in one faculty. It almost immediately brought together thousands of students from various faculties from the University of Tirana, and soon after from the University of Agriculture in Tirana. They all came together in front of the Ministry of Education. 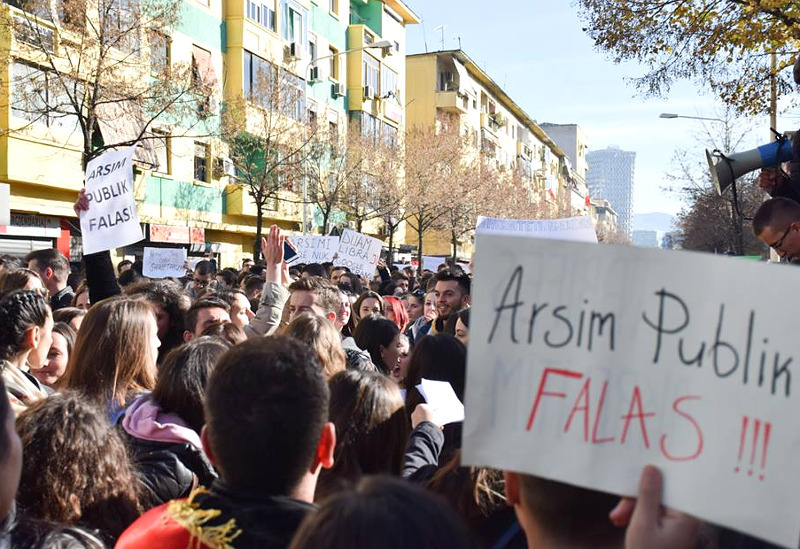 Inspired by their fellow students in Tirana, in the following days students from other universities in the major cities of Albania organized similar protests at their own universities and some even came down to join the student protest in front of the Ministry of Education. Arsim Publik Falas! – Free Public Education! Albania had not seen a student protest, and indeed any other protest, of this scale since another December, that of 1990, when thousands of students organized the very first massive and open act of resistance to the totalitarian regime in the country. Naturally, many started to speak of a “Second December.” As the student protest grew larger, the anger shifted from unfair fees for re-sit exams to the unaffordable tuition fees, especially for the graduate studies, which have forced many students to take full-time jobs as waiters or call center workers and many others to quit their studies. There was anger against very poor conditions in dormitories, degraded or inexistent laboratories, lack of student libraries, the pricey books filled with plagiarized material which students are forced to buy, the corrupt professors asking for money in exchange for a passing or good grade and, against the notorious Law for Higher Education (the Law), which has deepened and sealed the endemic problems of public universities. The days of the protest were filled with anger, passion, hope, enthusiasm, creativity and perseverance, inspiring Albanians inside and outside the country. Many citizens joined the protest and many others brought food and water for the students. These were also very difficult days in which the student protest, young and full of dreams, was tested by the manoeuvres of the main political parties that tried desperately to derail the student protest (the Socialist Party government) or to capitalize on the momentum created by the protest energy (the opposition parties). At first Prime Minister Edi Rama ignored the protest, calling the protesters “failed students.” However, faced with increasingly larger crowds across the country, he began asking for dialogue and negotiation with student representatives. The student response from the streets was a clear and resounding – “No representation” and “No dialogue, No negotiations” on what they called basic demands. Ignored by students in the streets, the PM snuck into meetings organized by the university high-level officials. In unheard of acts of disobedience and courage, the students confronted the PM or left the halls. Another coping strategy used by the PM was to shift the blame for the student anger from the Law to the university administration and academic staff – a move which, as we will see below, may have backfired as seen in the activation of the faculty general assemblies. Meanwhile, the opposition parties, in a total crisis of legitimacy and indeed lacking any political vision to inspire and mobilize people, sought to highjack the student protest by framing it as a movement against the government. The students forcefully rejected the opposition parties, as well. Their message was clear – all the main political parties were equally guilty for the appalling state of the public universities. Faced with such rejection, the youth forums of the political parties were activated to persuade the students to move the protest from the Ministry of Education to the PM’s headquarters, and thus shift the focus from demands on education to demands to bring down the government. For many days, the students resisted and remained in the square in front of the Ministry of Education. However, as the Minister disappeared from the scene and as the PM took up any engagement with the students, through social media and in university halls, the argument for staying at the Ministry of Education weakened. Eventually, the protest actions moved in front of the PM’s headquarters and focused on meeting the eight demands and repealing the Law for Higher Education. The student protest was temporarily suspended during the year-end break. During this period, the PM introduced a set of measures, declaring that all the student demands had been met. Unhappy with the measures, the protest resumed on January 7, 2019, when despite the freezing temperatures, students congregated again in front of the PM’s offices. Currently, many students from several faculties in Tirana, and in some other cities, have boycotted classes, and some groups of students have remained inside the university halls in what is being called a “university occupation” or “active boycott.” Whatever the label, the students are engaging in clear political acts of re-claiming and re-imagining the public university as a space of freedom and critical thinking about the future of the university and society. In doing so, the students are conducting self-organized lectures and political discussions on the Law and the vision of public education, watching political documentaries, planning for the next steps, and singing and dancing, among others. Amidst the student protests and the scapegoating of academic staff by the PM, professors in various faculties have called for general assembly meetings. Held for the first time in some faculties, such assemblies have consolidated the support for the student boycott and demands, including the repeal of the Law. In light of the outcome from general assemblies in various faculties, the Faculty of Geology and Mining in Tirana just called (22 January 2019) for a general assembly of representatives of the academic staff of all faculties, which would be again the first time such a meeting is held. In response to the ongoing boycott of the classes, and committed not to repeal the Law, the PM has launched the Pact for the University, which is now being discussed at all the universities. The Pact still fails to address demands to increase the weight of the student vote, to lower the tuition fees for graduate studies and to guarantee that private universities will not have any access to public money, which leaves the question of lowering tuition fees in public universities unresolved. It is unclear how meaningful would be the students’ voice in this process. During a recent discussion on the Pact, the PM asked a student to leave the hall after she raised again the demand of the student protest to repeal the Law. Amidst attempts of the government to introduce measures which divide the undergraduate and graduate students, the Socialist Party youth forums to break the boycott, the pressure from the university administration, and often biased or limited media reporting, the student resistance continues. Thus what appeared as a spontaneous student protest is still going on in multiple forms. Except that it wasn’t that spontaneous. It is quite understandable to anyone familiar with the workings of social movements. For several years, a small group of activists, composed mainly of students and a few professors, have been resisting tirelessly the reforms and policies to commercialize public education in Albania, preparing the ground for the wave of student protests in December 2019. Under the banner, “The University is in Danger” (Universiteti në Rrezik), these activists started coming together as early as 2011 to oppose the draft Law for Higher Education prepared by the current opposition parties (at the time in a coalition government). The then chairman of the Socialist Party, Edi Rama, also opposed the draft-Law, denouncing what he called the extreme liberalization reforms of public education being carried out by the government. Ironically, it was the Socialist Party government, with Rama now as prime minister, which passed the Law in 2015. Unable to stop the adoption of the Law, the activists continued their actions under the name the “Movement for the University” (Për Universitetin). Throughout these years, the activists of the Movement held hundreds of meetings with students in various faculties of Tirana discussing the serious problems of the Law, such as commercialization of public universities and access to public funds for private universities, which would arguably lead to ever increasing tuition fees. They have continuously opposed the Law in various TV programmes, and have disrupted events where the PM and the Minister of Education have appeared. 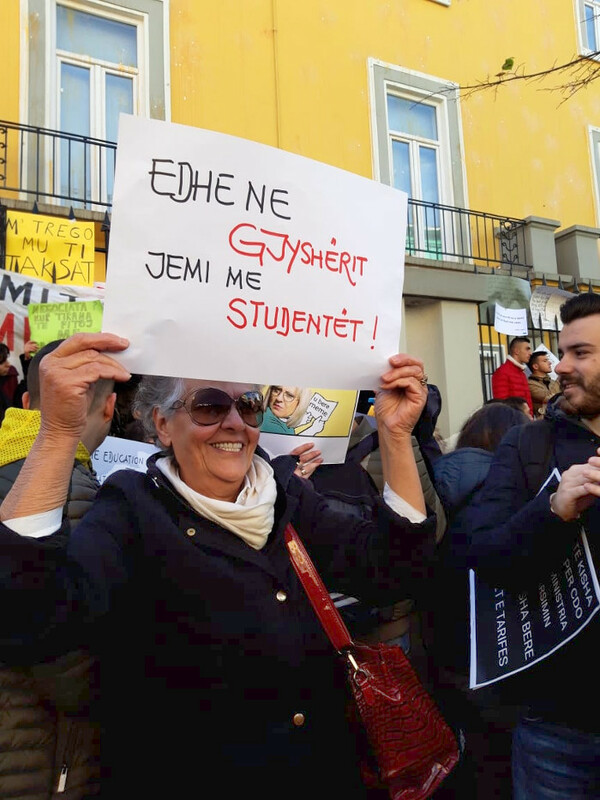 Under the banner “For the University, For the Society” (Për Universitetin, Për Shoqërinë), the activists have organized several protests at the Ministry of Education and at the PM’s building. The last was on November 22, 2018. Frustrated with the turnout, the activists I met with during the protest said they had spoken to hundreds of students across various faculties. In a matter of days, what they had been working so hard for, did materialize. Life – and indeed mass mobilizations – have far more twists and turns than what we can ever imagine. Throughout the student protest, be it in the streets or in the universities, thousands of students have continued to chant the slogans of the Movement developed during these years. A few days into the protest, one of the activists declared on TV that they are still amazed at the crowds of students in Tirana and around the country. Passionate, enthusiastic, and inspiring, the activists continued their mobilizing even when they were attacked by the government, the opposition parties, the youth forums of the three main political parties, and the media companies close to them, all of whom branded the student protesters as Marxists, which in a country with a painful (not very distant) history of a brutal Stalinist regime, is a sure way of knocking-out the opponent. Trying to undermine the role of the Movement in the student protest, the youth forums of the opposition parties claimed to be the organizers of the student protest and, in some cases, they even used force against the activists of the Movement to stop them from speaking at protests. The differences among the members of the youth forum and the activists of the Movement couldn’t be starker: the youth forums had powerful sound systems that only political parties could afford, the activists of the Movement had modest megaphones and very hoarse voices from trying to do what the megaphones couldn’t do; the youth forums would sing the national anthem and chant nationalist slogans, the activists would speak of the problems of the students and of the right to education for all; while the youth forums would brag about being the organizers of the student protest, the activists of the Movement would only focus on keeping up the energy of the protest and on uniting the students. While the student protest has several dimensions worth exploring, the focus here will be on its significance in the context of the dramatic transformations in the country during the last three decades. In the early 1990s, the Democratic Party government, the newly formed party after the fall of the authoritarian regime, followed religiously the IMF’s prescription for radical shock therapy of marketization – the rapid destruction of the economic base of the state-controlled economy through (mostly) closure or privatization of all factories, mines and oil fields. In the late 1990s, the Socialist Party government, as well as succeeding governments of other parties, embraced a radical neoliberal agenda of marketization and commercialization of public services such as education, healthcare, water and electricity. Grannies are with the students too! Throughout these dramatic events, there has been no massive organized resistance. Existing trade unions have failed miserably to mobilize workers in defence of jobs or of public services. They have failed to organize any resistance against poor wages and working conditions facing most Albanian workers. They have even failed to mobilize mass protests in cases of tragic deaths of workers in construction and mine shafts, and massive poisoning of workers in garment and shoe factories. Pockets of worker resistance in some of the mines and oil fields have often been betrayed by what workers themselves have called hidden alliances between the unions, the private firms and the government. The role of the existing trade unions has become so insignificant that a few years ago the Prime Minister infamously invited Italian entrepreneurs to invest in Albania as there were no trade unions that could pester them. A few other mobilizations have occurred recently against the commodification of public spaces, the destruction of nature and the demolition of supposedly illegal houses to build larger roads. They, too, have been unable to mount a massive resistance. Thus, Burawoy suggests, “students, once the pride and joy of the nation’s future, suddenly find themselves fighting for their survival, turning them from citizens to costumers, corrupting the meaning of public education.”4 The massive resistance mounted by the student movement in Albania, I would argue, represents that historic event when certain forces in society emerge to counter the forces of free markets and protect the society from the destruction brought by these forces. The Albanian student movement is very similar to the social movements of exclusion, discussed by Burawoy, as such movements represent “responses to different forms and dimension of marketization.” The driving force for these new social movements of exclusion “is not a mobilization from within major institutions but from outside against those institutions.”5 Despite focusing on different dimensions of marketization, these movements share a number of common features, which are also displayed by the student movement in Albania. First, Burawoy argues that although focused on a national issue and framed by the specific political conditions, the new social movements of exclusion are connected across borders through social media or traveling ambassadors and inspire each other. In the case of Albania, many of the activists of the Movement For the University have drawn inspiration from, and shared information with, the International Student Movement founded more than ten years ago to support the connection of, and the exchange of, information between education activists fighting against increasing commercialization of education and for free and emancipatory education for all. Even the logos of the two movements share similar elements. 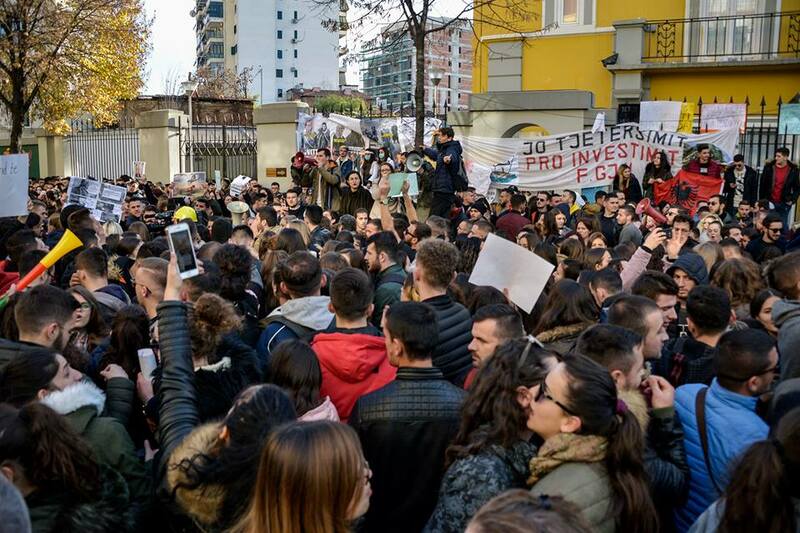 The International Student Movement Facebook page has shared and continues to share updates about the developments of the student protest in Albania. A third feature, identified by Burawoy, is that while rejecting formal democracy, these movements adopt direct democracy referred to sometimes as “‘prefigurative politics’ that involve horizontal connections as much as vertical struggles.”7 In the Albanian case, as noted earlier, the students rejected any representation by the discredited student councils that had failed to be their voice over the years. They also refused forcefully to elect a representation committee of students. This was partly due to the fear that the committees would not be able to resist the tactics of the PM, who could use the dialogue to weaken the protest. The more fundamental reason, which emerges from the various exchanges with the students during the protest and the chanted slogans, I believe, is that there was a strong feeling that their voices have been disregarded for too long while the university was being destroyed through reforms and policies. Thus, the request for dialogue was just too little, too late. Empowered by the energy of the protest, the students found the courage to stand up to the arrogance of the power and felt they were the ones to decide now. In doing so, the students have also inspired their professors to resist the government’s arrogance, teaching them the power of direct democracy as seen in the attempts of the academic staff to activate, in some faculties for the first time, structures where direct democracy can be exercised, such as faculty and inter-faculty general assemblies. Fourth, Burawoy observes that the virtual connections are made effective by meeting points in concrete real space. In this way, the squares where the people meet become “crucial to establish dense and creative communities, and the planning of new and novel actions” and social media “an auxiliary, if essential, tool of communication.”8 For the student protest in Albania, too, the social media played a key role in connecting students and in planning actions and is continuing to do so. The role of the social media is all the more important given the lack of structures and often biased and/or limited media reporting, particularly when the resistance shifted to the university halls. At the same time, the assembly point in front of the Ministry of Education, and currently at the universities, have helped the students to realise the common experience of frustration and anger with a failed education system which affect all students, although some more than the others. Thus, the students are learning to move from an individual phenomenon of personal failure to the interrelated social phenomena of a “failed education system,” “poverty and inequality,” and “unholy alliances of capital and political parties.” In this way, the streets and the universities have become spaces of building solidarity among students from various faculties, of political education and critical thinking, and of student empowerment to stand up to authority and decide for their own future: “We refuse to be the future. From today we’ll be the present.” It certainly has provided the Movement for the University with possibilities to grow and mature. Indeed, the Movement has become increasingly popular, with at least 10,000 new followers on their Facebook page and with many students joining the meetings held at their modest center. Burawoy discusses a fifth point – the severe backlash from police against the occupation of public spaces. While the extent of violence during the protest is still undetermined, there were no reports on police violence against the students during the protest days. In fact, many of the police, not only during the student protest of December, but also during the other student protests organized by the Movement for the University, seemed to silently solidarize with the students’ demands. Moreover, as one of the activists of the Movement had argued, any violence against students would have provoked a strong backlash from citizens. Indeed, in one of the days of the protest, the police were quick to quash the rumour, supposedly based on “leaked information” to the effect that they had issued an arrest order for a number of activists. In recent days, however, where the protest has moved from the streets to university spaces, the private security firms operating in universities and police forces have been more active. Away from the public eye, they have intervened to clear the faculty corridors from tables and chairs used by students for their common gathering, and have allegedly engaged in acts of intimidation and physical violence against the students. A final point is the significance of the student movement in Albania. Polanyi warned of the danger that the response to commodification may have a reactionary character. Instead of emancipatory and progressive movements, it may lead to the emergence of fascism and the right-wing populist movements as we are seeing in many countries in Europe. Thus, perhaps one of the greatest services that the students are doing in Albania is helping to channel popular anger and depression away from right-wing nationalist agendas, at least for the time being. The student movement, with its amazing explosion of anger and hope, with its remarkable acts of courage and power, especially by female students, with its posters, slogans and human microphones, with its lessons of direct democracy, with its determination to continue occupying the streets and the universities, despite attempts to divide the movement and despite lack of structures, has provided the space for the articulation of demands for free public education and for imagining a public university which gives the students dignity and the country hope for the future. F. Block, “Polanyi’s double movement and the reconstruction of critical theory,” Interventions Economiques , 2008: 1. Karl Polanyi, The Great Transformation , quoted in S. Pahle, Bringing the Workers’ Rights Back In? The Discourses and Politics of Fortifying Core Labour Standards , Department of International Environment and Development Studies (Noragric), Norwegian University of Life Sciences, PhD Thesis 2011: 44. M. Burawoy, “Social Movements in the Neoliberal Age,” in Marcel Paret, Carin Runciman and Luke Sinwell, eds., Southern Resistance in Critical Perspective . London: Routledge, 2017: 28-9. Edlira Xhafa is a labour researcher and activist. She has a Masters in Labour Policies and Globalization from the Global Labour University (Germany) and holds a PhD in Labour Studies from the University of Milan, Italy. She has engaged in labour issues since 2000, working initially with trade unions in her own country Albania, and later on with unions in countries such as the Philippines, Bangladesh, Cambodia and Myanmar. She has also worked for, and collaborated with various international trade unions and labour organizations. Edlira is currently coordinating the Global Labour University Online Academy.